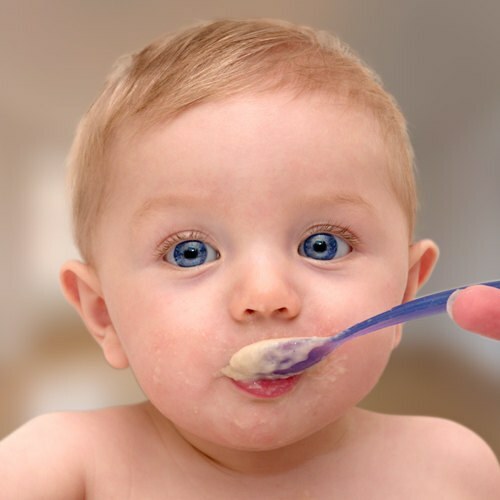 The lure is food, which is introduced into the diet of the child after they reach 6 months in addition to the main food (breast milk or formula). The purpose of introduction of complementary foods is providing the child those nutrients, the intake of which major food is not enough, and teach your kids to be more "solid" food, that is great consistency from the breast milk or formula. Remember, any new type of food for a baby is a major shock to the digestive system, which was still exclusively breast milk or its substitutes, the most close to him. Prikarmlivat with small amounts, about 1 teaspoon, gradually increasing quantity up to the age norm and completely replace one milk feeding. Every day give the child a new food at the same time, gradually accustoming of the digestive tract and the Central nervous system of the baby to the new diet. So the child may easier adapt to new food. Irregular introduction of complementary foods may cause increased flatulence, bloating, regurgitation, restlessness or diarrhea. Accustoming the child to a puree, be careful. Not worth it to give your child mashed potatoes, if he's ill, has an allergic inflammation of the skin, which causes rashes or redness, and during vaccination to avoid causing additional stress to the immune system of the baby. Feed your child before breastfeeding, or a mixture, and then decarbonate breast milk or its substitutes. So the child will be easier to teach because he is hungry, and bolder will try unfamiliar foods. You can also walk with your child outdoors to be more hungry. Closely monitor the health of the child, the state of his skin and the nature of the chair. When the tendency of your child to get allergies "diary of complementary feeding," in which mark the child's reaction to a particular product. If the Allergy is still occurred in the form of increased excretion of stool, bloating, skin rash, contact your pediatrician, who will help you to solve the question about the possibility of continuing this or a similar product.